Home PAGASA PAGASA Weather Update for TS "INDAY" 11:00 PM 18 July 2018. 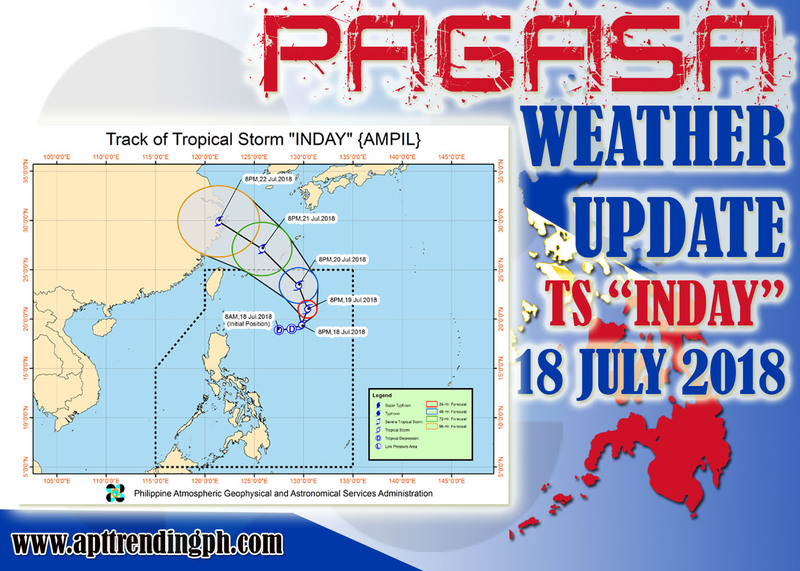 PAGASA Weather Update for TS "INDAY" 11:00 PM 18 July 2018. "INDAY" HAS INTENSIFIED INTO A TROPICAL STORM AS IT CONTINUES TO MOVE NORTHEASTWARD. The Southwest Monsoon (Habagat) enhanced by Tropical Storm "INDAY" will bring intermittent moderate to occasional heavy monsoon rains over Ilocos Region, Cordillera Administrative Region, Zambales, Bataan, Pampanga and Bulacan. Meanwhile, scattered light to moderate with at times heavy rains is expected over Metro Manila, Cagayan Valley, Cavite, Batangas, Laguna and the rest of Central Luzon until Friday (20 July). Residents of these areas, especially those living in low-lying and mountainous areas, are advised to take appropriate actions against possible flooding and landslides, continue monitoring for updates, coordinate with local disaster risk reduction and management offices. Sea travel is risky over the western seaboard of Central and Southern Luzon due to rough to very rough seas associated with the Southwest Monsoon. The weather information is courtesy of DOST-PAGASA.